Difficulty 1: I don't get why a salt bridge is needed. People say it's to maintain the overall neutrality. But in both cases where salt bridge is a tube of solution and a membrane, two half cells can be seen as one. So as long as no thing leaves either of the two half cells, the whole is always neutral. 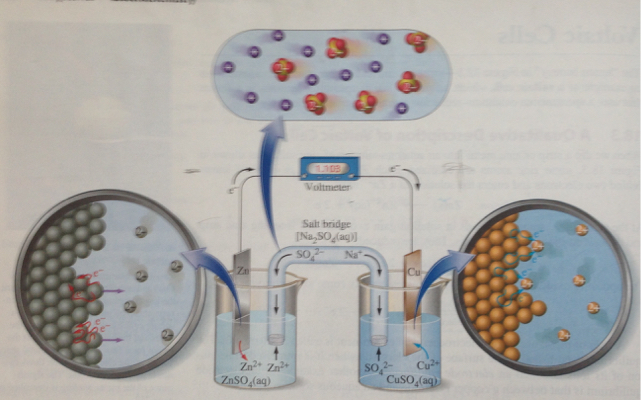 Difficulty 2: as in the picture, cations go to the right cell, and anions go to the left. I can understand that anions go the left because the number of zinc ions increase as the reaction proceed. But in the right half cell, the electrons are being absorbed, its charge cancelled by that of the copper ion; I don't see any need for sodium ions to move to the right. Regarding Difficulty 1) When the zinc bar (unconnected) is first immersed into the solution, some zinc ions immediately dissolve away. Now the zinc bar has extra electrons and the solution has extra positive zinc cations. This is entropically acceptable, however, because cations in the solution (both zinc cations and hydronium cations) can align close to the surface of the zinc metal (creating what's called the 'Helmholtz layer'). One might imagine that as soon as the zinc bar was connected, the extra electrons in the zinc would drain to the other side of the cell. But they don't because the electrostatic pull of the zinc and hydronium cations in the left-beaker solution is holding them back. There's an analogous situation in the right cell: the copper metal can't accept any electrons because of the electrostatic repulsion of the sulfate and hydroxide ions in right-beaker solution. Regarding Difficulty 2) When the cell is running, there is an electrostatic gradient across the membrane where the salt bridge meets the right-side solution (among other places, for more info see note 1). Cations (such as sodium) are driven out of the salt bridge; anions (such as sulfate) are drawn into the salt bridge. Sodium cations are smaller and diffusion more quickly than the larger, slower sulfate anions. Overall, many more sodium ions will leave the salt bridge compared to the number of sulfate anions that will enter the salt bridge. There is an analogous situation at the membrane where the salt bridge meets the left-beaker solution. Note 1, Electrostatic Gradients) When the cell is running, the zinc bar has a slightly negative charge and the copper has a slightly positive charge. If we let ourselves ignore the metal wire for the moment, this creates an electrostatic field throughout the cell very much like the classic "electrostatic field around adjacent positive and negative charges in a uniform media". Notice that in the diagram of that situation, there are electrostatic field lines pointing from the positive charge straight-across to the negative charge. Another way to describe this situation would be to say that there is an electrostatic gradient between the two charges. If you drop a much smaller, and otherwise free-floating positive charge any where in the neighborhood around those two charges, it will move down electrostatic gradient to the negative charge: the same way rain-water flows downhill, (in that case due to a gravitational gradient). Now imagine there was an imaginary plane exactly halfway between the two charges: you could now also say that there is an electrostatic gradient across that plane, from the one side to the other. If you dropped a positive charge right beside the plane, but on the same side as the bigger positive charge, the electrostatic gradient would drive the positive charge across the plane. Similarly, if you dropped a negative charge next to the plane, on the same side as the bigger negative charge, then again the electrostatic gradient would drive the negative charge across the plane. In the electrochemical cell problem, the electrostatic field lines are going to be more complicated because there are two materials (air and water / salt-bridge) with different permittivity. Long story short: the electrostatic fields will actually be much stronger in the water than in the air. The strongest part of the electrostatic field will go from the copper electrode, across the right-side solution, through the salt bridge, and across the left-side solution to the zinc. So, among other places, when the cell is running, there will be an electrostatic gradient across the membrane where the salt bridge meets the right-side solution. Your problem is that through wires electrons move from one compartment to another, but if there's no salt bridge and charge cannot build up, current simply does not flow. Yes you are right, since charge is cancelled, we need to get back the positive charge back in right compartment. Similarly in left as zinc is increasing, positive charge is increasing, so to balance sulphate moves. In both cases, the total charge in a vessel must remain constant (not neutral). I'll put it in a different way for you, so essentially what we are doing is that one side is taking electrons, so it becomes more negative, and the other side becomes positive. And the salt bridge is to maintain this electroneutrality or in other words, to maintain one side from becoming too negative or positive. So at the end of the day, the positive cations go to the cathode and the negative anions move to the anode. Is there always a need for a salt bridge to let a galvanic cell work continuously? Describe the function of a salt bridge, What would happen if the half-cell compartments of a galvanic cell were not connected? Electrochemistry: Does ion flow from one half-cell to another?